The morning of Nov. 9, Margot Lebow was beside herself. “The day after the election [of President-elect Donald Trump], most of us were in the dark in fetal positions,” the longtime Reston resident said. But Shaffer thought more people might be in need of a place to gather and talk. So she posted the invite on Facebook. “We had about 45 people who showed up, and many of them we’d never seen before,” Shaffer said. At that meeting — and a subsequent one that had an even greater turnout — teachers, children, immigrants and more were given a platform to speak and share their concerns about what the future may bring. “That kicked off a very powerful discussion,” Gerstein said. So was born a community activism group the women say is designed to show support for those who feel threatened — and to make sure the principles laid out by Reston founder Robert E. Simon are remembered and followed. Simon, who in 1961 purchased 6,750 acres that would become Reston, founded the community on seven principles — among them, that the importance and dignity of each individual be a focal point of community development. The women who gather at Cafe Montmartre considered themselves longtime friends of Simon. They said they fear a new zeitgeist that normalizes bullying, mistreatment of others and political incorrectness will result in the “importance and dignity of each individual” being forgotten. The women say their group isn’t rooted in politics, but rather in ensuring a proper sense of community is maintained in Reston. A separate group, Herndon-Reston Indivisible, has been founded to tackle purely political issues. Lebow said the idea that Restonians look out for their fellow community members — no matter what race, religion or background — cannot be lost. The women say they continue to plan the future of their group and hope to have more information about upcoming meetings soon. Their goals include continuing to support local charitable organizations including Cornerstones in their efforts. Jesse Bonfeld, Lebow’s husband, said the group understands how important it is to make sure everyone’s voices — not just the loudest — are heard. 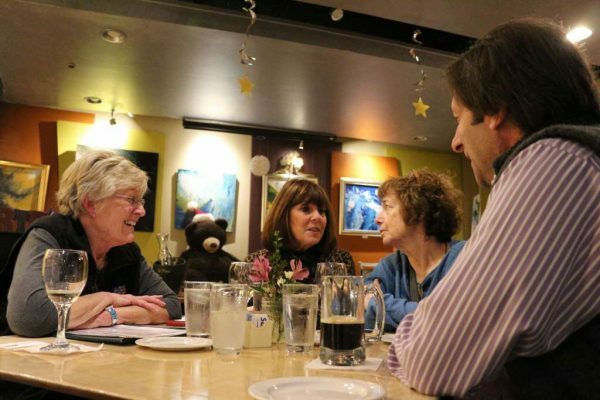 Pictured: From left, Donna Shaffer, Margot Lebow, Susann Gerstein and Jesse Bonfeld meet at Cafe Montmartre in Lake Anne Plaza on Wednesday evening.